Hiya guys! I have a post to share with you that I've been holding on to for over a week. Ugh. 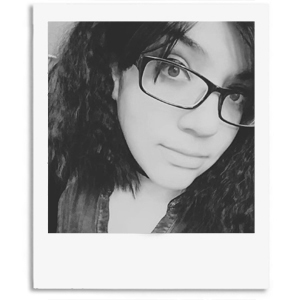 You guys have been so supportive while I go through all my ups and downs, but I still feel so bad about being behind. I started posting swatches over the weekend on Instagram in anticipation of this post. 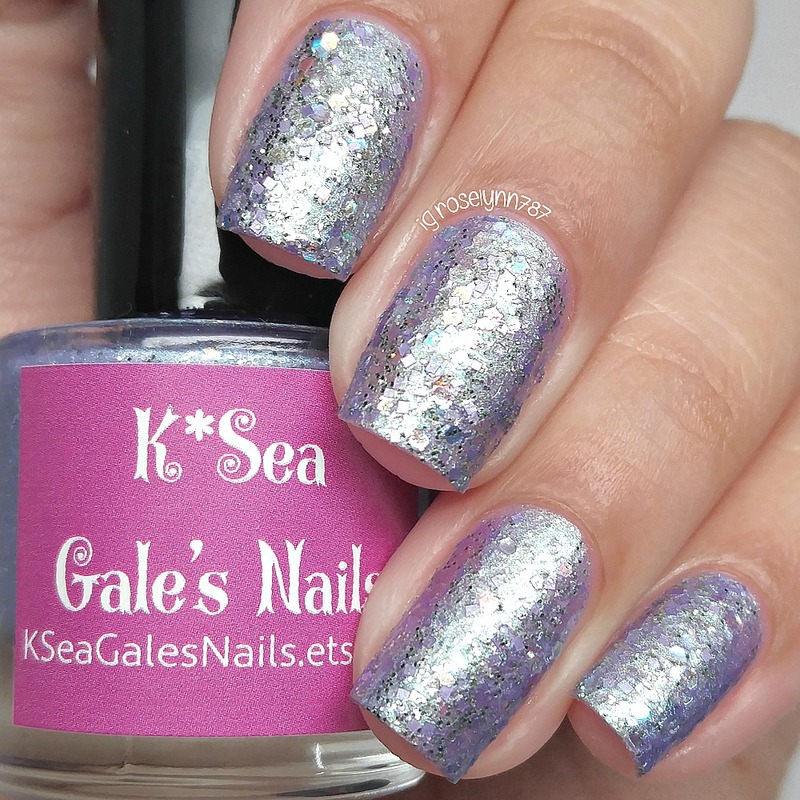 Last week K*Sea Gales Nails (formally known as Supernails) had it's grand opening / rebranding launch. 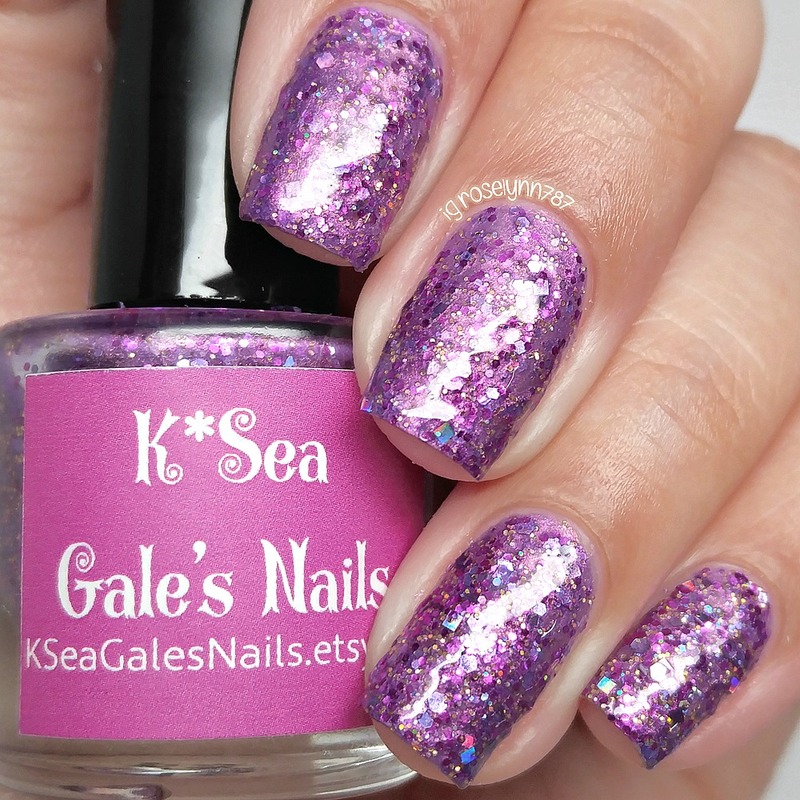 As Supernails, this indie focused on glitter toppers for the majority of its existence. 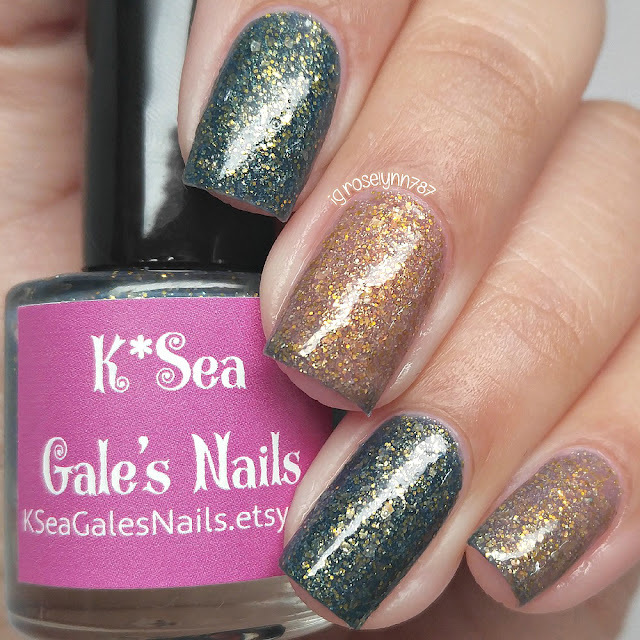 Now as K*Sea Gales Nails we can expect to see a lot more variety in finishes, which I am SO excited about. I received the Gypsy collection, which is one of six brand new collections! Let's go ahead and get started! The Gypsy Collection from K*Sea Gale's Nails is now available for purchase. Each polish retails in full-size (15mL) for $9.00 and in mini-size (7.5mL) for $5.00. The entire collection can be purchased as a full-size set for $49.00 and mini-size for $27.00. 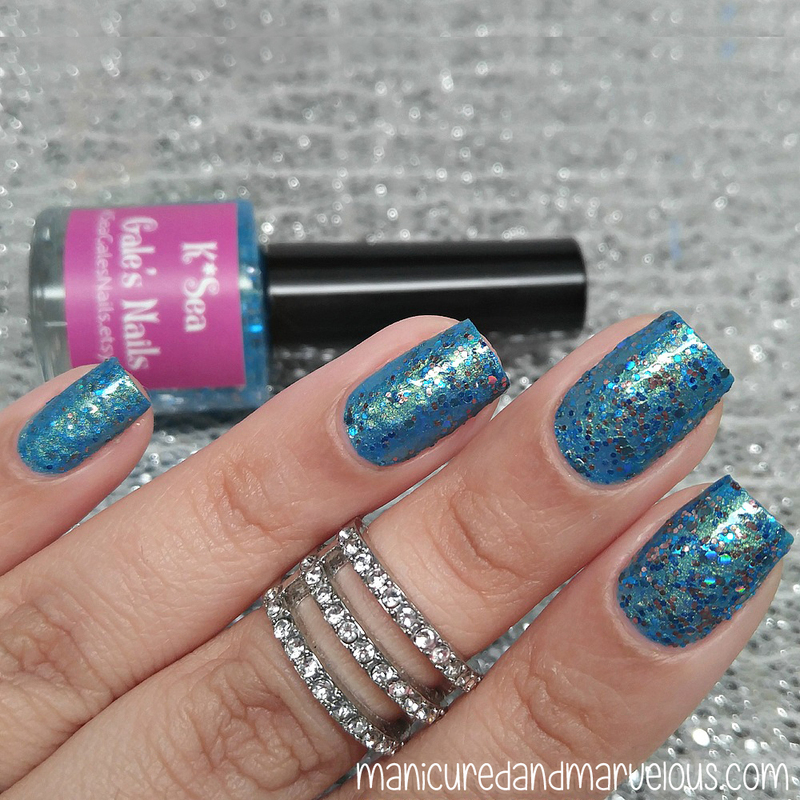 Dreams can be described as a shimmering turquoise blue with gold sheen, full of glimmering blue, rose gold and holographic navy blue glitters. Starting off with my favorite pick from this collection! Normally I don't gravitate towards shimmers heavy on the glitter side like this, but the combination in this one is gorgeous. It makes me think of an underwater treasure or a mermaid even. The formula applies well and it really opaque on a first coat. I ended up using a sponge and dabbing on a second coat to reduce the possibility of brush strokes. Shown in two coats and topcoat. Drum Circle can be described as a shimmering golden lacquer with green sheen, full of holographic gold, turquoise and brown glitters. Definitely one of the most unique combinations that has that bohemian/gypsy down pat. Formula has a smooth application, builds up nicely without any issue. It does dry to a semi-textured finish due to the glitters, but a topcoat does smooth down the finish. Shown here in two coats and topcoat. Gypsy can be described as a dark plum-blue crelly when cold and pink when warm that is full of iridescent holographic silver, neon pink, blue, teal and pastel pink and blue glitters. Ahh, I love me a cute thermal! This beauty has a dynamic color shift that I achieved by using cold and hot water. 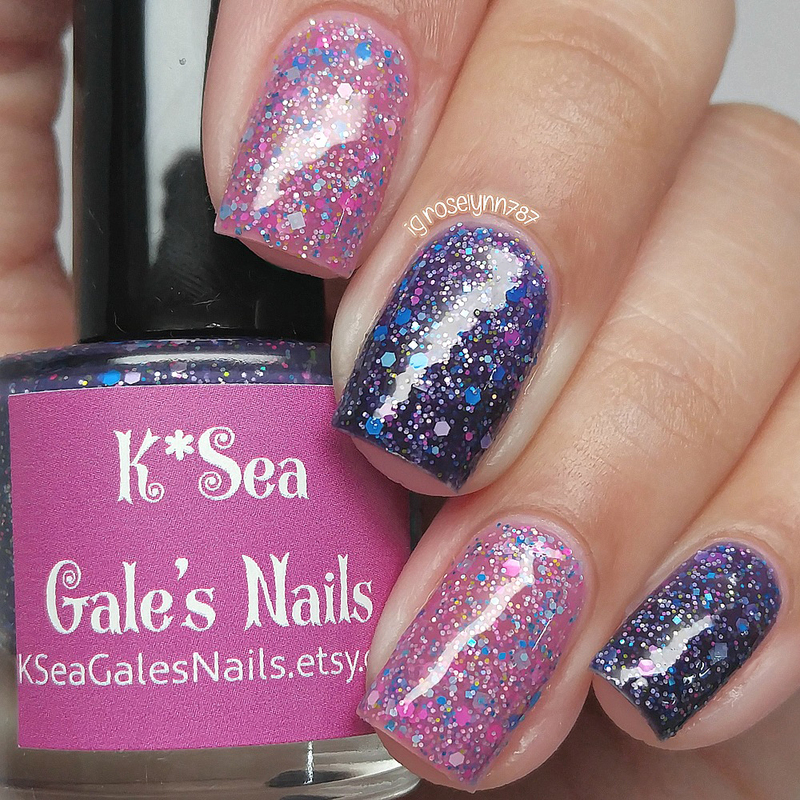 The formula is a bit on the sheer side, but ends up building to a opaque finish whilst showcasing ample glitter. While in its warm state (pink) I feel it looks a bit more on the sheer side and you can see a nail line if you look close enough. Shown in three coats and topcoat. 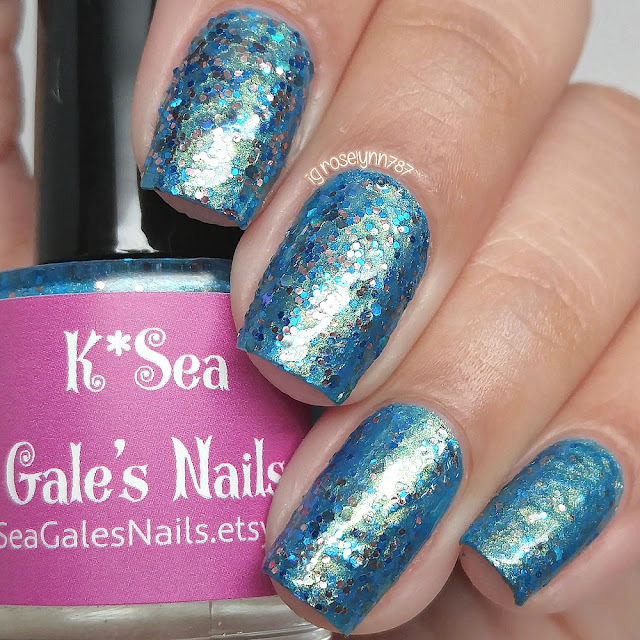 Land or Sea can be described as shimmering dark blue with golden sheen when cold, light brown when warm, full of glimmering gold flakies and glitters. There is always one polish I end up wearing a few days after a reveiw/swatches and this one was it for me. Very bohemian, it goes perfectly with the feeling/inspiration of this collection. Smooth application and consistency, not too thick or too thin. Could easily get away with two coats if you use thicker layers, I applied it with a very light hand in this case. Shown in three coats and topcoat. 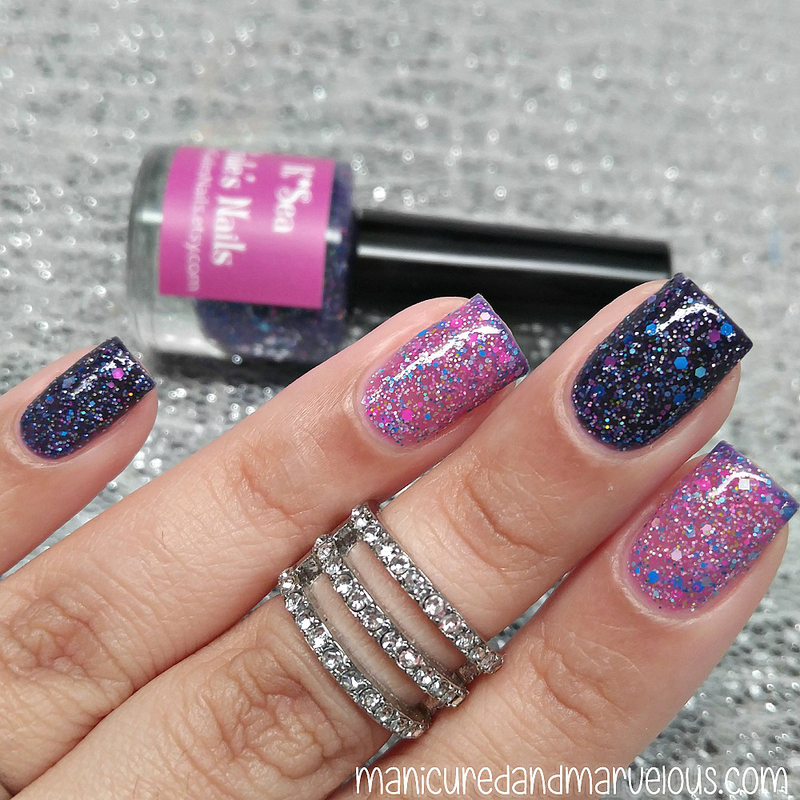 Travel can be described as a shimmering bright purple lacquer with gold sheen, full of holographic gold, fuchsia and violet glitters. The formula applies well, I ended up using a sponge to dab on the second coat for an even finish. It dries gritty, but smooths down completely after a thick layer of topcoat. The appearance though remains semi-textured because of the color combination of the shimmer and glitter. Shown in two coats and topcoat. Wings can be described as a shimmering lilac lacquer full of lavender, iridescent and pale seafoam green glitters. Doesn't this almost look like butterfly wings? With the look of the texture it really pulls off a nature look effortlessly. Formula had a smooth application although prone to some visible brush strokes. I ended up using a sponge to dab the second coat for an even finish (and it helped blend the brush strokes). Again with the combination of the glitters and the shimmer the finish looks really textured. Shown in two coats and topcoat. Overall this whole collection has such a unique feeling to it, there isn't a single polish that I think I might have a dupe for. That said, the thermals far outshine the other polishes for me. Although I can appreciate and acknowledge that these have a unique look, I personally don't like how textured a lot of the shimmer finishes look. The only exception to this is Dreams, which is just drop dead gorgeous and my pick for must-have. Side note about the mini bottles (which is what you see here), I absolutely love the sizing and shape! I think they handle really well and I actually ended up purchasing the new Beach Day Duo in this size (which I'll be sharing with you once I receive it). But anyway, let me know what you guys think? I'd love to hear which one is your favorite! 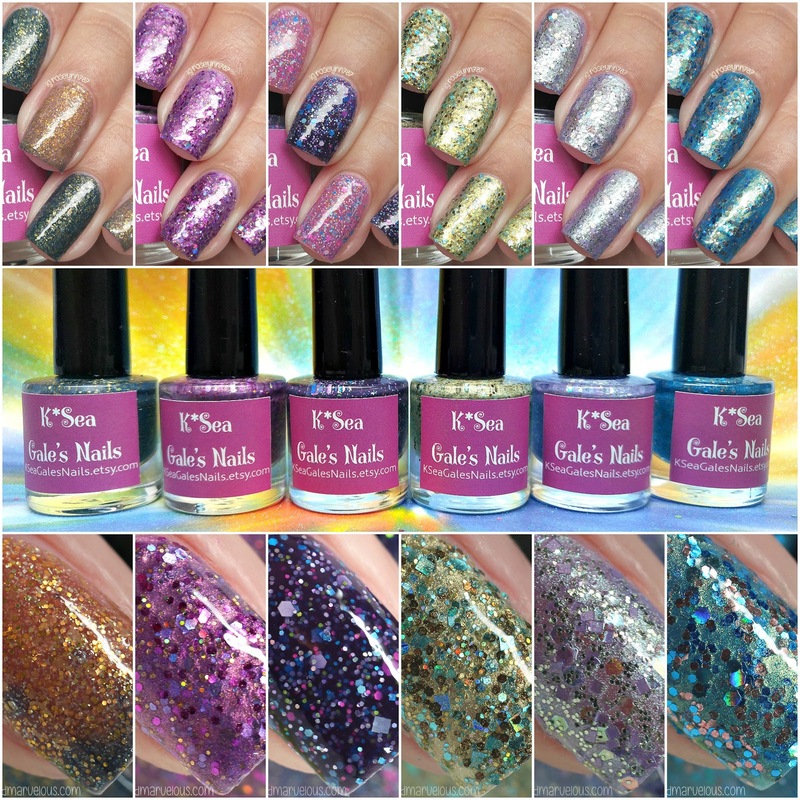 To recap, the Gypsy Collection from K*Sea Gale's Nails is now available for purchase. Each polish retails in full-size (15mL) for $9.00 and in mini-size (7.5mL) for $5.00. The entire collection can be purchased as a full-size set for $49.00 and mini-size for $27.00. Oh my!!! This collection is soooo pretty. I love every color and love the texture too. A must try indeed! These are so unique! I really like Drum Circle and Gypsy. I really like Gypsy and Land or Sea, but then again, I'm a sucker for a good thermal so it makes sense. I kind of dig these. I've not seen anything quite like them. Very cool. Beautiful job with the swatches too! So much glitter!! I love these! Great swatches, as always! These are all very pretty! Your swatches are amazing but I agree with you with regards to the look of the texture. The thermal is very pretty, though. Those are stunning, I could look at your swatches all day!! I agree on the texture, but I do like Wings a lot! That thermal is pretty incredible, too! These polishes look so pretty!